Today I faced a strange network issue on my laptop while trying to access the Internet. My laptop failed to go online and while checking the Network and Sharing Center there is a red cross symbol displayed between my computer and Internet icons. It means there is no connection between my computer adapter and the Internet. 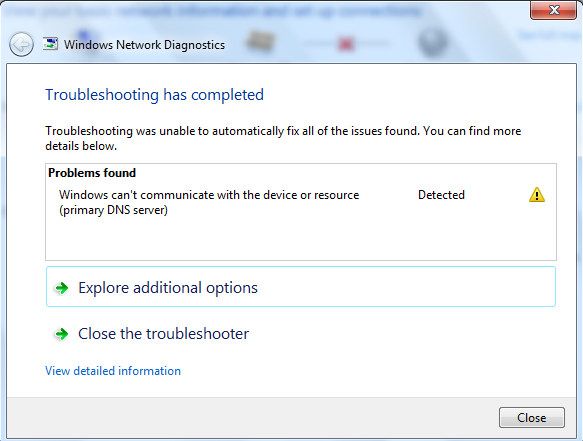 While running Network Diagnostics, Windows showed an error message Windows can't communicate with the device or resource (Primary DNS Server) with two options to click either Explore additional options or Close the troubleshooter. Screenshot of the error message is shown below. I opted to click Explore additional options to find if there any Windows remedy to the issue. The result was not much help. So I decided to troubleshoot the issue by myself because the automatic Windows diagnostic tool failed to fix it. By analyzing the error message, it is clear that my laptop is not online because of its failure to start communication with the Domain Name System configured on it. I have been using default ISP Domain Name System details on my laptop by choosing the option Obtain DNS server address automatically under TCP/IP properties. I have changed the option to use the DNS address added manually on my laptop. Soon after changing the option to use the Domain Name System address I have added (I used Open DNS address), the issue got resolved and my laptop started accessing the Internet. If you want to know how to change the default Domain Name System settings on your computer, visit the link below. In case if you see this message on your laptop when you try to go online, I recommend you to follow the below procedure. Power Cycle your network. You can follow the instructions provided in the link below to perform it. If the issue persists, follow the instructions in the link below. In many cases, the Domain Name System provided by user ISPs are slower or not so efficient. If your PC cannot contact the DNS server of your ISP, your computer will not be able to access the Internet if you type the domain name of a website on the browser. It is because Domain Name System is converting domain name of a website into the corresponding IP address. By changing the default Internet Service Provider's Domain Name System information to another reliable system, we can resolve the issue. Thanks for your comment but the issue can be resolved by the solution provided in this post. Domain Name System information configured on a PC is connection specific whether it is wired or wireless. I faced this issue when I was using WiFi adapter to connect Internet.